It feels like I've been a bit slow with posting these past few weeks. I think the Singapore trip sort of turned our routines upside down somewhat. Before we left, we had this nice, workable pattern to our day - manic, non-stop chauffeur duty from 830 am to about 4 pm every other day to get the kids to and from preschool, then tea-time at home (while the dishwasher got emptied and refilled), followed by cleanup (by the kids), and then a movie while I prepared dinner. We were like a well-oiled machine! And then we flew off to foreign lands and had zero routine (other than swimming daily). Now, a month after we got home, the jet lag has worn off and I'm back to my mad chauffeur schedule, but the kids - oh! They're insane. They won't watch movies. They want to do stuff all the time with me. All the time. Every day. Today I needed to finish something on the sewing machine and I begged them to watch a movie. BEGGED. Almost had to bribe them. It went something like this, "Look, if you watch a movie now, maybe I can finish sewing this. When I finish sewing this, we can put away the fabric and take out the cardboard and make the Barbie house for Kate's birthday, OK? Please watch a movie now, yes?" Only two of them agreed. The third wanted to help me with the sewing. Finally convinced her to make something out of card stock instead. And then this beautiful weather! 60s over the weekend, and 70s tomorrow. I can't stay indoors when March is behaving like May! This is why I haven't actually made anything in a whole month, apart from one laundry hamper and one mermaid tail. There aren't even spare moments in the day to sneak in a few seams at the sewing machine. Good news, though - I'm getting my wisdom teeth out tomorrow. Hurrah! An excuse to act sick and be horizontal on the sofa and not play with the kids. I might claim to be well enough by tea-time to be vertical at the sewing machine and finish what I didn't finish today (reason: various children needed help with Perler beads and tuning a guitar and the bathroom). Do your days feel completely cuckoo, too, or is it just us in our vacation aftermath? Anyway, wanted to check in and respond to some requests and questions I've been getting in the email. First, I am thrilled that so many of you have come to visit after reading my cardboard article in this month's Family Fun Magazine. Welcome! All you need to know is that there are two main kinds of projects on this blog - cardboard, and sewing, and I swing violently between the two. Some of you wrote to ask where to find the projects featured in the magazine, and if there are patterns. The short answer is no, I don't provide templates for my cardboard projects, largely because many of them are huge, and almost all of them have dimensions entirely dependent on the cardboard boxes/sheets I have in the house at the time. I also think it is good practice for people to try and make their own templates because, rather than just trace around somebody's pattern and follow their method of construction, one can learn so much by figuring out on one's own, how something is done. For instance, Emily watched me make a cardboard stand for a cardboard computer once, and since then, she's used that same basic technique on her own for many other projects of her own, including a music stand, a microphone stand and a table for her dolls. I do, however, provide as much instruction as can be documented, for many of my cardboard projects. There are two ways to find them on my blog. 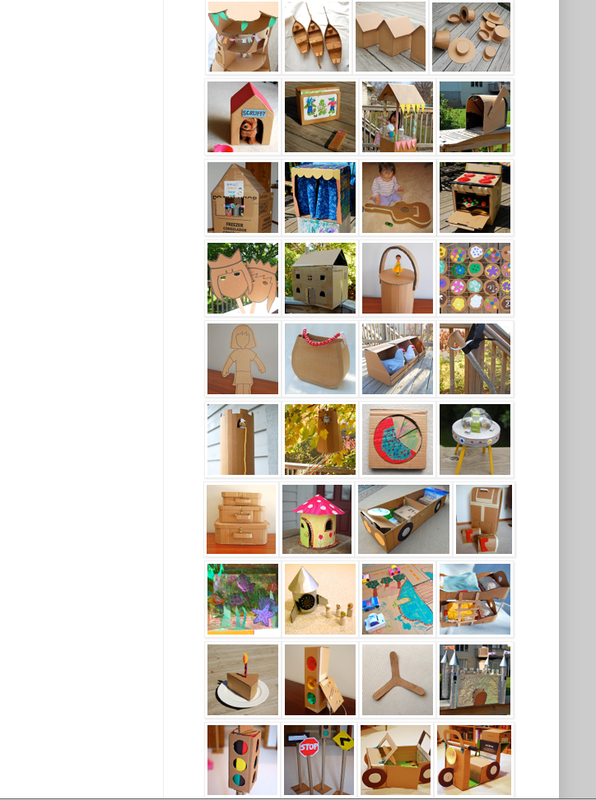 Scroll to the end of that post, where there is a montage of 40 cardboard projects. Each photo is an individual link to that project so click on the one you want and it should take you to the post in question. 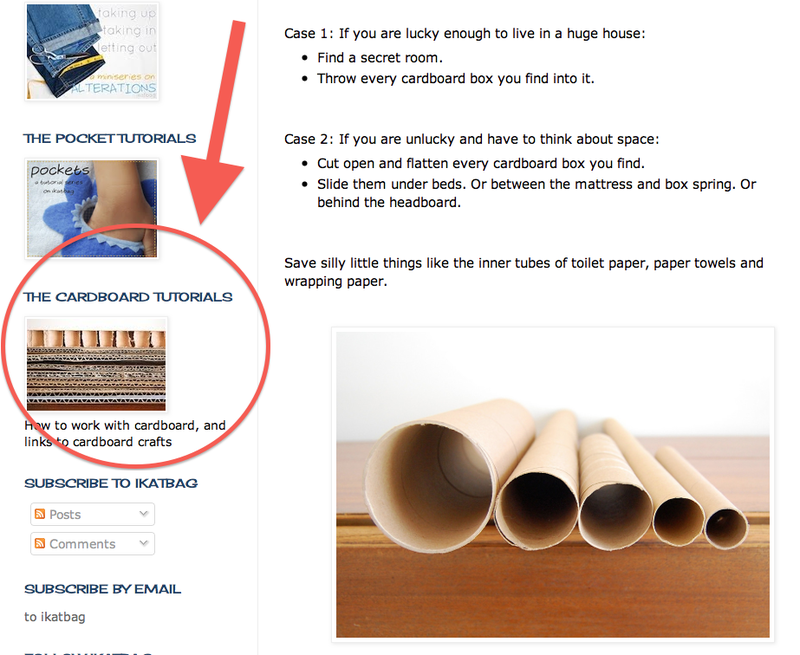 Since I wrote that post (last year), I've added more cardboard projects, so the more updated way is to click on the "Paper" category in my sidebar and it will pull up all the posts related to paper. 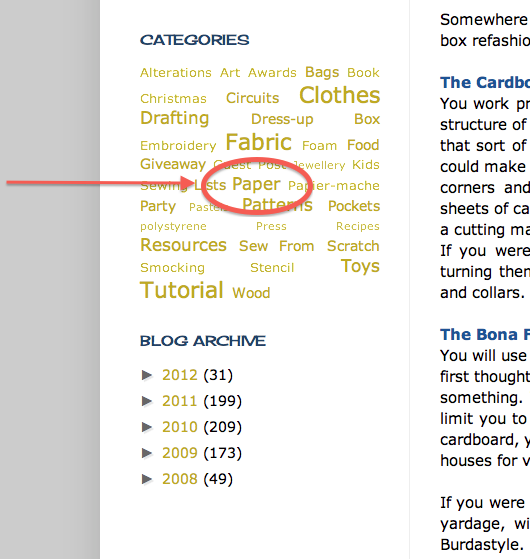 Why I categorized cardboard stuff as "Paper", I don't know. 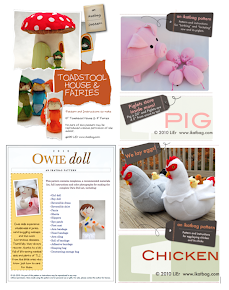 Back when I started my blog, I had only three categories: Fabric, Paper and Foam. I would never have guessed that someday I'd have odd projects like "Smocking", "Pockets" or "Circuits" that would need their own category. The second kind of question I've been asked is about fabric, and how to build a stash when one is a beginner. I thought I'd answer that here, too. To begin, I very seldom buy fabric I don't know what to do with. By that, I don't mean I know exactly what project I want a particular fabric for. Rather, I mean that when I see, covet and purchase a piece of fabric, I know what kind of project I want it for e.g. the other day I saw a peacock blue home dec fabric with white scrolls on it, and immediately I knew I wanted it for a large bag (design as yet unknown). So I bought a yard of it. Another example: some weeks ago, I saw a brown printed cotton fabric that I wanted to use as a trim or accent fabric for small pouches. I bought half a yard of that. It is very, very rare for me to see a fabric in a store and think, "I really like that! I don't know what it will be good for, but I should buy it so I won't go home and regret not buying it." If no project comes to mind when I look at a fabric, I will not buy it. Conversely, whenever I see a fabric, a project - sometimes vague, and sometimes with all the details in - immediately comes to mind, which then makes me covet it, and subsequently fork out money for it. For that reason, I also very rarely buy fabric online, because I can't touch it. The descriptions (e.g. 100% cotton, 45" width, or 97% cotton, 3% rayon) mean nothing to me if I cannot touch it, because there is so much variation even within those 100% cottons. Q1 Is it for clothes or not? These are apparel fabrics, the ones of which appeal to me are almost always a solid linen or something equally plain but with a nice texture. I very rarely buy print apparel fabric. If yes, go to Q2. If no, skip to Q8. Q2 Is it for the entire garment? If yes, go to Q3. If no, skip to Q6. If so, work out the yardage in head according to these rules. Q4 Is it for me or for the girls (sorry, husband)? Again, estimate the yardage according to these rules. Q5 Does this garment also need lining? Interfacing? If so, estimate yardage according to these rules, and head over to the lining/interfacing aisles and pick those up too. Q6 Will I need it only for part of a garment (like the sleeves)? If yes, estimate the yardage according to these rules. Q7 Will I enjoy having remnants/leftover yardage for a second (or third) garment? If so, I'll double the yardage. If not, I'll buy exactly what I need, to the nearest quarter yard. I very, very rarely buy extra if it's costume fabric. I hate having remnant costume fabric, because they're not versatile at all, and can hardly be used to, say, trim an everyday-wear summer dress. Certain basic colors, especially in knit, are always worth buying more of. I often buy 2 yards of white, grey or blue knit if it's for a garment for me, or 1.5 yards if it's for the girls. That 2 yard cut usually allows for one adult garment plus leftovers for the girls, and the 1.5 yard cut is usually enough for 2 kid garments. Q8 If it's not for a garment, what is it for? These are usually the funky designer quilting cottons or home-dec fabrics whose prints are more likely to stop me in my tracks and tempt me. If it's a bag, I usually buy a yard. If it's for small pouches and miscellaneous small items, I'll buy a yard if it's not expensive; otherwise I'd buy half a yard. If it's for trimming or an accent fabric on a more solid background, I'll buy half a yard. Q9 Is it on sale? If it is, and it's a basic solid, like white twill, natural canvas etc, that I usually use a lot of anyway, I'll buy 2 or more yards. Q10 Is it one of those pre-priced remnants? I'll buy not less than half a yard and not more than a yard. And that is how I've built my stash over the dunno-how-many-years it's been since I started sewing. I've also inherited fabric from Mum, so some of the stuff in my fabric closet is older than even me. Keep sending me questions, folks, if you want to know anything! And now, off to the sewing machine - ugh. Perhaps I'll actually finish something soon and take photos of it! Exactly, Dawn! Notice I didn't say I actually USED the fabric I purchased. I just had a specific garment in mind for it, in my head, and it's still in my head, years later. At least we had something in mind, right? Hee. I knew you were one of those mommy-bribers. I followed your link to 'estimating yardage' and I concur. I grew up somehow knowing this and even worked in a fabric store during high school. When I see elaborate blog tutorials popping up with exact directions or even "how to thread your sewing needle', I get mildly annoyed. 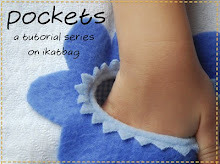 I sew by the seat of my pants and decided early on I did not want to provide tutorials to simple items and then claim ownership and declare you could not produce the simple item to sell and make all kinds of claims about it being mineminemine. Although I will share tips that I have discovered (thru trial and tribulations). I like reading blogs that encompass the realities of life. The blog itself is not a 'job' but a reflection and journal of your creative journey. Thank you. You write very well - succinctly, I might add. Agree about those tips! And just recently, I watched a video tutorial on how to thread your needle with one strand of thread (rather than double) so it doesn't slip out while hand-sewing. It was a great tip! I love the internet for all those interesting tips - some more groundbreaking than others, but all very cool ideas from other people who simply do things differently from me! My stash was built without my realizing it. Among the ladies at church it is known that I sew and over the years I've been the recipient of gifts of fabric when they were moving, downsizing, retiring, etc. I graciously accept any and all; sort through it for what I believe I can use and pass the rest on to someone else or donate it to a thrift store. Another source for me over the years has been yard sales and thrift stores. I routinely check for fabric and buy it for much less (usually pennies on the dollar) than it would cost "new". Sometimes I have a use in mind, other times I just like the fabric. Doesn't matter, I've used it all eventually; and miraculously it has been replaced with something else. Yes! Don't you love how it all gets replenished? I've bought big pieces of fabric (usually plain) at garage sales and turned them into kids' tents. These were often bedlinen or curtains that I knew I would never use in my own home for those purposes, but they were perfect to cut up for projects. And I didn't feel guilty cutting into them because I knew they'd had a previous life and were ready for something new! LiEr- I am so excited to get the magazine that had your work featured. I 'know' her, through her blog! A few questions: when making school lunches, do you use reusable bags that you made yourself? I want to, but have not found the right patterns and fabrics. Also, when you go to the store, do you bring your own handmade produce and shopping bags? You inspire us well, looking forward to the next thing! Thanks, Jenny! I remember seeing articles by bloggers I know, like Filth Wizardry's Lindsay, and Pin&Green Mama's MaryLea, and saying exactly the same thing! Very exciting to see people I know in magazines and books! When I do school lunches, I pack them in zippies or bento boxes and put them in Emily's store-bought little lunch bag. I don't use lunch sacks /brown paper bags because they get squashed in her schoolbag. And unfortunately, no, when I go to the store, my groceries and sundries come home in plastic bags and paper bags. The paper bags get reused as kitchen trash or cut up and used to wrap packages for the post office. The plastic bags become bin liners for our bedroom and bathroom trash cans. I wish I could say I bring my own bags to stores, but the truth is, if I can remember to leave the house with the right number of children, I count it mission accomplished enough for the day! Thanks for this post Lier. Sometimes I was so tempted with nice fabric in store but didn’t know what I will do with it. Now I will look at your yardage estimation rules and then buy fabric. Oh and there are people in this world who could use any simplest tip such as how to thread a needle or maintain their sewing machine etc.. Thanks. I agree with you (see my reply to Kathy's comment above). There is always something we can learn about something someone else might overlook as really simple. I've been sewing for years and only a couple of years ago found a new way to unpick stitches. Unpick stitches!!! It wasn't a right way (implying that what I'd done in the past was wrong) - just ANOTHER way I hadn't heard of before. And if I were taking up something new - like crochet or knitting, for instance, I'd too appreciate any tip or tutorial on the simplest, most beginner-ish aspect of the craft! LiEr, you are so, so smart and I adore your blog. You know so very many things I don't. But may I be so presumptuous as to give you one piece of advice to just try out? When you are trying to get something done (productive or not), tell your girls to "run along and find something to do." (And that is a complete quote.) In no uncertain terms and leaving no room for negotiation. Your girls are plenty old enough to engage themselves for an hour or more without specific instruction or collaboration. Might they be confused and displeased the first time? Yes. But it will be good for both them and you. I also really appreciated the post about fabric purchasing. I unwisely purchased a few pieces of fabric that 'I just liked' when I first started sewing. They are the last to disappear from my stash, as they are either never right for a project or are too small for the job. Luckily, this was a very short-lived, short-sighted phase. Your link to estimating fabric yardage was awesome, as I missed reading it before.